Above ground pool pumps are an essential part of a good hygiene for swimming pools that provide enjoyment, fun and luxury to users. This type of pool pump regulates (or specifically circulates) the water in the pool to make it crystal clear, clean and hygienic. The Hayward SP1580X15 Above-Ground Pool Pump is one of the best examples of this type of pump. Discover more of its amazing features which set the standards for value and capability. 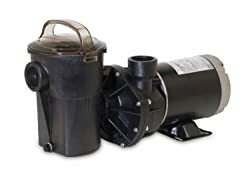 This 1.5-hp, rated 115-volt pump is totally dip-proof because of its double-size and heat-proof seals making it more resistant to wear and tear that enhance longer life for the motor, therefore prolonging the life of the pump. The debris basket of this product can hold up to 118cu. in. of debris. This large volume will enable the pump for a minimum of maintenance allowing you to save more money in your electric bill. The heavy-duty all-weather pump casing is a reinforced and corrosion-resistant thermoplastic housing permitting the quietest of operation. This Power-Flo FX Series comes in 91GPM (at 20 Feet of Head) capacity and with a durable strainer that can collect large debris, such as small stone, leaves and other large objects that may flow through its 1-1/2inch suction (intake or port) pipe. Its discharge pipe is also 1-1/2inch in diameter which produces enough pressure for quick cleaning of the pool. One other reason why this pump has low maintenance is that of its self-oiling bearings which contribute much to its efficiency and durability. The bearings remain lubricated while in operation as they are designed as such. The pump is proven safe to operate even when current from the grid fluctuates or if overloading is inevitable because the motor is equipped with an automatic thermal overload relay system that automatically shuts off the motor when it is overheated or overloaded due to unavoidable circumstances. • Also auto-start: The motor also automatically starts when safer heat level inside the motor is reached. A real safety feature unique from other brands. • Quality material: The pump is made from patented PermaGlass XL which is high-strength and very tough, especially on vibration. • Easy to install: This pump can be installed easily because it has an only minimal piping system and the pump comes to you fully assembled. • No filter and heater included: This very affordable pool pump does not come with filter and heater, but they can be ordered separately and could be installed with minimum of modification in case you have assembled the pump system already. To better serve your requirements for pool pump, look for the best quality like the one tackled above which is proven safe, durable, and affordable and the finest quality among other brands. The Hayward SP1580X15 Power-Flo LX Series 1-1/2-Horsepower Above-Ground Pool Pump is an ideal pump for a medium-size pool for the family. Its capacity, large basket, low maintenance, voltage-rating, port size, and heavy-duty materials can really save you lots of time and money.